Every Tuesday I select one tarot card and give you my interpretation of it. See how it applies to your life. What messages are here for you? Each Wednesday I choose one reader's comment from Intuitive Tuesday and pull an additional card for more clarity...so check back on Wednesday (tomorrow) to see what cards come up. I used the Mystic Faerie Tarot by Barbara Moore today. I love the pictures on this deck. The Moon seems appropriate today since it is a Solar Eclipse and a second new Moon in Cancer. As one of my good friends, Laura, said, we are in the midst of an "Eclipse Sandwich." The first one was on July 7th, the second one is today (July 21st) and the third one will happen on August 6th. Wow! In her email to me about the Eclipse, she included these questions from Maya Del Mars Daykeeper Journal: "What were you doing 19 years ago? Did you resolve something or just repress it? You may not have known at the time, but you are finding out now. Is it back to bite you in the behind or will you transcend to a new level of awareness? Either way, change is afoot, and we have the wonderful chance to break out of the frozen habits of the past." Back to Intuitive Tuesday...You may remember, I selected The Moon card a couple of months ago for Intuitive Tuesday. Check it out to see what messages are here for you today. Remember, The Moon reminds you that something lies beneath the surface that is ready to emerge. What is it? How can you invite it to come into your world? Are you ready? Each stage of my life is a new bridge to cross on my journey to inner transformation. If I face a situation with anger and resistance, I will remain in place. It is only through dealing with each situation positively that I will grow and evolve. When I work with my inner Light and practice the laws of universal love every day, I discover the true meaning of life. These two cards together, especially today in light of the eclipse, are so powerful. What is the next step on your journey to inner transformation and how can your awareness of The Moon and all of her hidden depths, help you to bring it forth in your life? Oh, I've always loved the moon. The big, full, bright moon and the sliver moon. 19 years ago I was crossing a bridge, having just returned from a year in Japan. That was a cleansing year, and important one for me getting comfortable in my own skin. Thank you for all your wonderful comments .. I greatly value your input and friendship!!!!! 19 years ago was when I met who I thought was the Love of my Life. It was an illusion but the vibration of that love real or imagined remains with me today. At this moment my "Calling in the One" group has dwindled from 9 to 4 possibly 3 in less than 4 weeks. I don't know the significance, if any, in this phenomonon. I remain committed to the work. 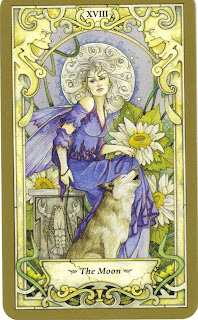 I think it is no surprize that the Moon card is pulled on this NEW Moon in Cancer. Cancer being about romance, home, family, love, security. That is what I was seeking 19 years ago. That is what I seek now. Thanks for reminding me that it's the new moon! I was born on the new moon, so it's when I'm supposed to be most fertile. I hope that what is emerging for me is my spirit baby, as she seems to be having a hard time manifesting in this world. I'm also hoping my fertility is re-emerging like it was 19 years ago. I remember my first "baby" doctor saying to me that I should have had kids when I was 22. Then he said, "what were you doing then?" I said, "I was in West Africa!" That's where I was 19 years ago, too. MentorTAZ's comment explains why my Cancer hubby wanted to be close to me last night. Too bad I'm a clueless Leo!! This definitely feels like a moon sort of day. 19 years ago I was 14 years old. Egads, that was an awkward year for me. It's about the time I really started feeling so shy and self-conscious. I've dealt with feelings of self-doubt and depression several times in adulthood, and that struggle has popped to the surface again lately. I'm trying to logically talk myself through it, but it's not easy. Definitely a moon sort of day. Perfect Moment Monday -- Just Like Grandpa!